The appearance of your site is determined by its CSS Theme. CSS stands for Cascading Style Sheets, and it essentially defines rules and properties of various elements on a page. You as a site administrator have the option to change the site's theme or modify it to fit your purposes. 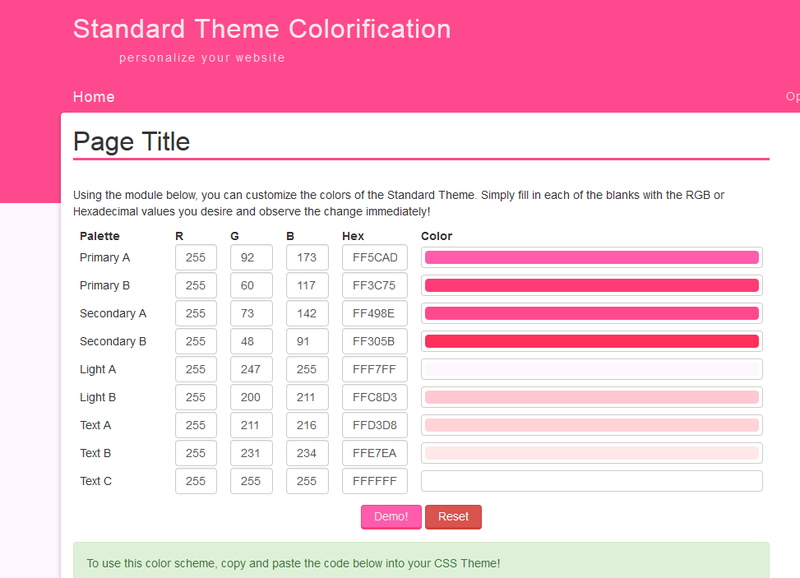 The default theme of the Standard Template is called, rather creatively, the Standard Theme. Utilizing a combination of sharp corners and round edges, the theme is fierce, yet elegant. Given its generic nature, it could be used with basically any site. You may, however, find that the default color does not fit your personality. Thankfully, the Standard Theme comes in eight different colorful flavors: Red, Orange, Yellow, Green, Blue, Purple, Black, and White. Best of all, we've made it pretty simple for you to select the color you desire. After it completely loads, click on the tab titled "You". Find the color you wish to use and click "Install". After it completely loads, click on the tab titled "Custom". Find the Theme named "My Colors". Note: Do not change the theme's name! Go to the top and click the tab titled "You". 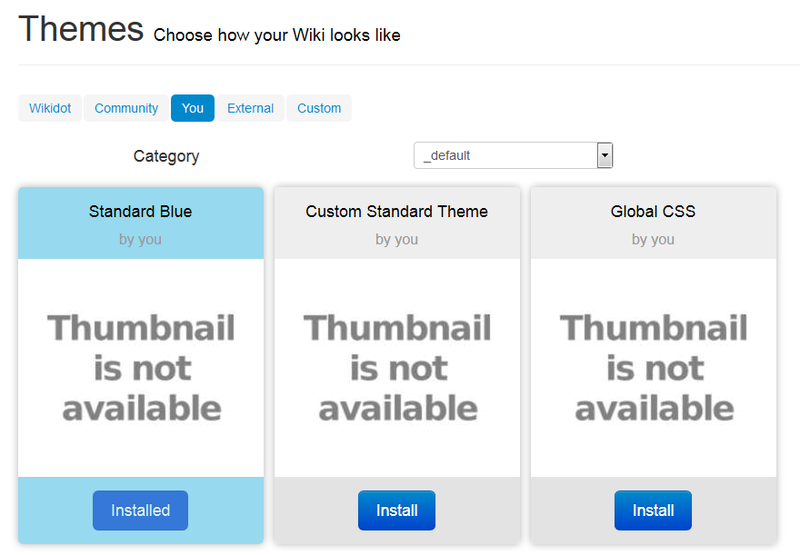 Find the option called "Custom Standard Theme" and click "Install". Perhaps you want a hot pink theme. No problem! Sometimes, you may wish to tweak your theme here and there. For instance, what if you wanted all links to be underlined? The Standard Template is set up to make this process very simple and painless. For this to be useful, though, you need to have an understanding of what CSS is and how it works. To learn more, W3Schools has some good tutorials. This process is slightly different for private sites. If you have a private site, please read the Private Sites section. Themes work using a partnership between the Site Manager and what are called CSS pages. If all you want to do is modify your current theme, you only need to edit one special CSS page called Global CSS. This page is exactly like a wiki page, except only admins (by default) are allowed to modify it. To access your CSS pages, go to the Themes Administration page. This page will list all the CSS Pages that you have created or are available. One of them should be titled Global CSS. If you click on it, it will take you to the Global CSS stylesheet. You can then edit the page and edit your CSS there. It may be that the Standard Theme does not fit the need of your site. Perfectly understandable! We in fact encourage that you customize your site in whatever way you wish! After all, Wikidot excels at site customization. Therefore, you may wish to create an entirely new theme. 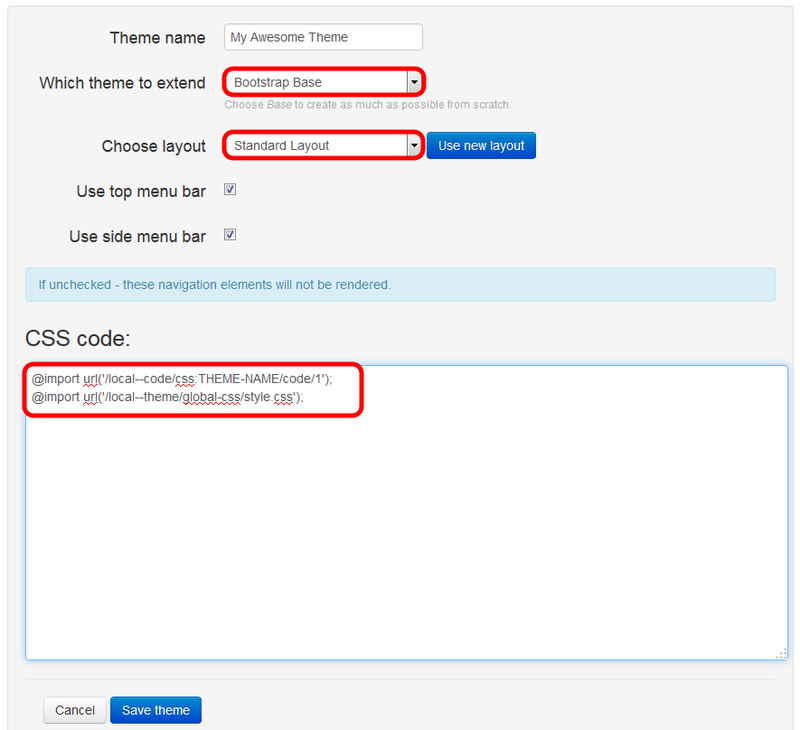 To do this, we encourage the use of the Themes Administration page, as this will allow you to keep a history of your site's CSS changes. The first thing you should do is create a new stylesheet page using the form provided on the Themes Administration page. This will create a new page with a little bit of code on it. Place your CSS between the provided [[code]] tags. This page will now appear on the Themes Administration page, and you may edit it at any time. By default, only admins are allowed to edit CSS pages. Find where it says "Create a New Theme", and click it. You should see a variety of options. On "Which theme to extend", change it to "Bootstrap Base". On "Choose layout", change it to "Standard Layout". Note that THEME-NAME is the name you gave the theme on the Themes Administration page, all lower case and spaces replaced with hypens. Once you press "Save Theme", this will create a theme in the site manager. Now you only need to apply it. At the very top, click on the tab titled "You". Find your theme and click "Install". If you are making your theme from scratch, it might be useful to know the page's HTML structure. This structure follows the Standard Layout, provided on that page for your edification. Note also that this layout is based on Bootstrap, and hence you have access to Bootstrap utilities and classes. Whenever you need to apply more tweaks, perform these steps again.